the canDIshhh tales: Win a Korean Beauty Loot! The Face Shop & Skin Food! 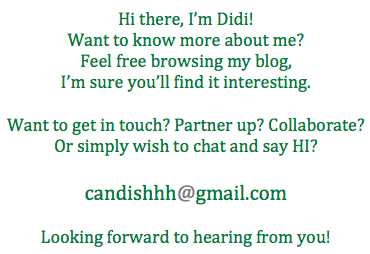 didi, will post this on my blog great prizes!! a) Which loot you want to win?? Well I want The Masks! a) Which loot you want to win! -> The Hot Masks! a) I want The Masks! Go! Go! Go! 2nd entry! a) I want The Masks badly! Can I ask about the mechnics stating you can post many times? So even though I just posted it on fb, but if I put it here/ comment here many times, all of that counts as entries? @Anonymous - YES, you are correct. You can post them repeatedly and they ALL count as entries. thank you! =)) happy anniversary, btw!